I left SFO at ~1am Thursday and arrived at HKG at ~6:30am Friday. This was my first overseas trip (!! ), and I flew the Singapore Airlines because that’s what all my HK friends suggested (with Cathay as the second choice). The humidity in Hong Kong is no joke- it was freakin’ humid! I was wearing comfy pants and a light sweater for SF night weather and the plane ride (planes with long flight tend to turn down the temp so everyone’s covered with a blanket). When I stepped out of the plane in Hong Kong, the airport was midly humid with AC on. But, when I stepped out of the airport, the humidity just hit me with a blast. I just wanted to take a shower and change to shorts immediately. So.. what’s the first thing you do after a 12-hr flight to Hong Kong? Wash up…. and then EAT! I stayed in San Po Kong with family friends, and after I showered, we went to a dim sum place right across their flat. There’s literally a restaurant or convenient store on every block, so you’ll never starve. Dim sum. There’s nothing like getting dim sum in Hong Kong (and I’m sure, in Guangdong). It beats dim sum in the States. It’s not greasy and it tastes way better. You can even eat dim sum by yourself, as the portions are much smaller! The menu is on the paper mat. It was in Chinese, so I could only look at the pictures, but it was too small to see what kind of stuffing the dish had. My friend did her best translating some of the dishes that stood out. We ordered six dishes. I was surprised to see a small portion of har gao; there are usually at least 4 in a basket in the States. All dishes were yummy. 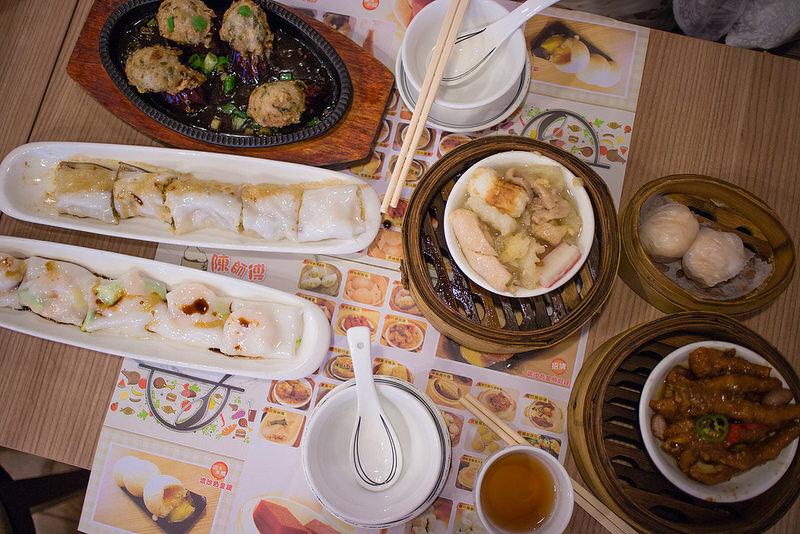 If you’re in Hong Kong, be sure to get dim sum. There’s many dim sum places in each city. Din Tai Fung and Tim Ho Wan are both Michelin Star restaurants, if you want to check those out as well.